Of all the Philips Hue smart lighting products I have, the Philips Hue LightStrip Plus is probably my favorite. It fits anywhere and there are endless cool things you can do with it that would be impossible with normal LED light bulbs. If I had it to do all over again though, I wouldn’t buy any Philips Hue LightStrips. Why? Because the MagicLight LED Strip Light is pretty much the same thing, but it only costs $29.95 instead of $90. 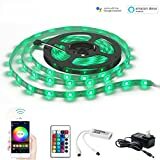 ✔ Compatible with Alexa & Google Assistant: Voice Control Your MagicLight WiFi Strip Light with Amazon Echo or Echo Dot and Google Assistant. ✔ Works with IOS/Android: Personalize Your Lights to Match Your Mood, Control it Remotely When You are not at Home, DIY Your Lights Depending on Various Events by Connecting it to IFTTT. ✔ Various Modes: Color Palette, Group Control, Music Mode, Timer, Dimmable, MIC Function, DIY Mode, Scene Mode …It is great for holidays and events like Christmas, Halloween, Parties etc. ✔ Applications: Showcase, Residential, Office, Hotel, Shop, TV Backlighting, Exhibition Room, Landscaping, Indoor, Dining Room, Bed Room, Upstairs, Kitchen, Porch, Desk, and Living Room etc. ✔ What You Get: 12V UL Listed Transformer + 16.4Ft 150LEDs IP65 Flexible RGB Strip Light + WiFi Control Box with 24Key Remote. 30-Day Money-Back Guarantee for Any Reason + 18 Month Warranty for Quality-Related Issues.